I’m on Spring Break but the fiancé doesn’t get back until later tonight. So I’m chilling and apparently picking up Buy Sell Trade items as my parents continue to freshen up the house now that half of their two kids are moving out soon. 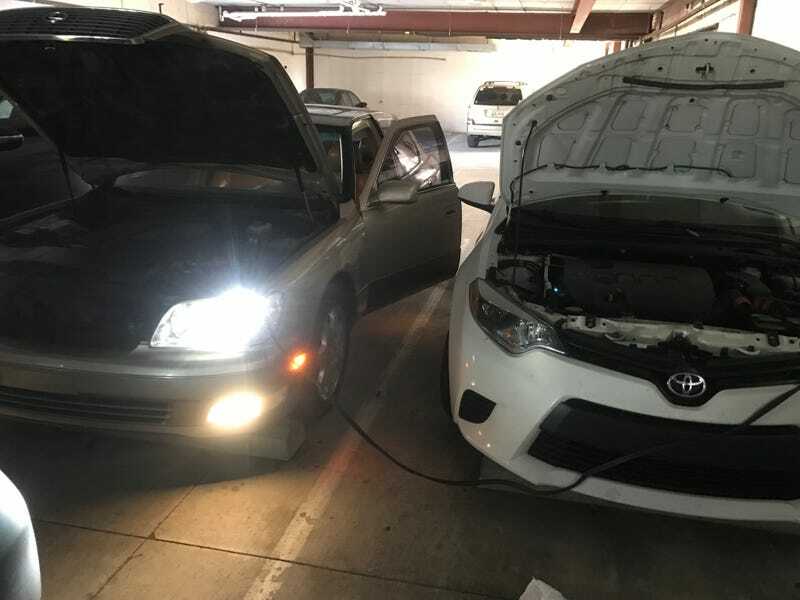 Here’s me jump starting Alexus with a Toyota because I left a light on after eating Taco Bell earlier in the week. Also the story of me jumping my car... Took a load downstairs to put in the car, as I walked up thought I saw a light on but doubted I would do that to myself. Get closer and sure enough,overhead light is in. Started asking my friends to bring their car and 5 minutes later someone was there(I have good friends). I jump start the car and the alarm starts going off because LS400, then I notice the Climate Control and Outside Temperature Screens are just green with no writing and the Front Defroster is flashing on and off .Crap. I had jump started it correctly and had no idea why was wrong. I get out of the car and the car door shuts on me. Keys are locked in the car. I ran upstairs to grab the 2nd set I keep around and when I come downstairs the Climate Control is working perfectly. I am confused but amused as the LS400 has once again fixed itself.